Asterix and the Great Rescue was originally released for the Sega Game Gear back in 1994, and is based on the long-running French cartoon and comic strip series Asterix the Gaul. It features platforming and exploration elements that puts you in control of the titular character Asterix, as well as his sidekick/best friend Obelix. It is common for video games based on the Asterix franchise to feature crisp, well-animated visuals that almost look like actual cartoons instead of pixel work. Asterix and the Great Rescue is no exception, as it seems to take full advantage of what the Game Gear hardware can provide, with large (for a handheld, anyway) sprites, colorful stages, and well-animated characters. There are flickering issues, but I chalk it up to the limited hardware. It's just annoying that the flickering is so noticeable since it's being used for a lot of effects: when Asterix is damaged, when he gets an invincibility powerup, and even with the fire pillars. Other than the minor flickering gripe, this is still hands down one of the best looking games on the system. Unfortunately, it doesn't play as good as it looks. 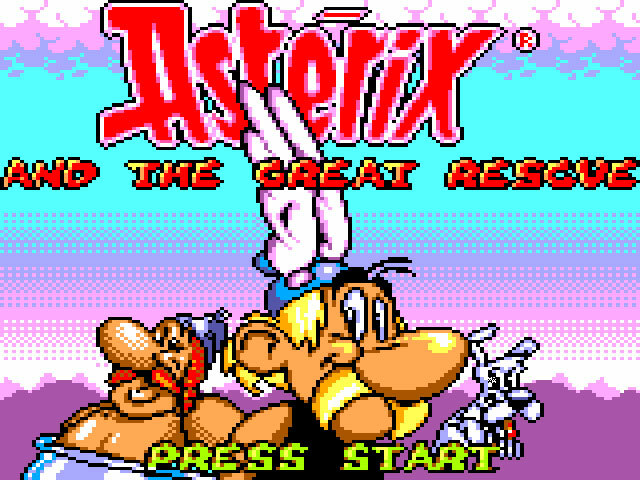 While there is a certain amount of exploration involved, Asterix and the Great Rescue is a platformer at heart. Like Super Mario Bros., you have to jump through bottomless pits, leap through walls of fire, climb moving platforms, and fight random enemies to get to a destination. It's certainly a good recipe for a fun game, but the execution leaves a lot to be desired. Obviously, there are control issues. 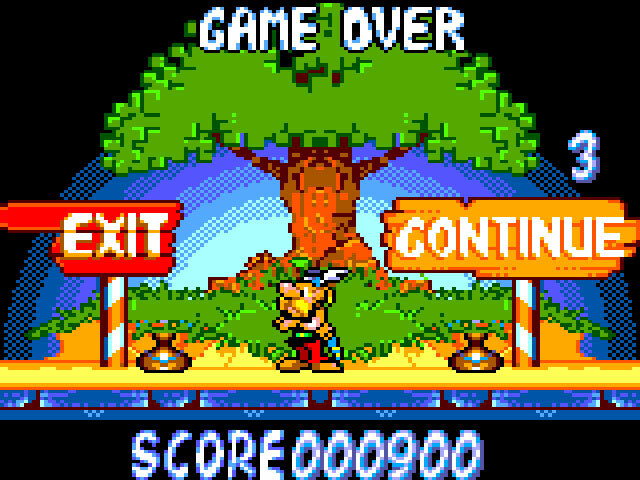 Both Obelix and Asterix (you can switch between the two on the fly by pressing Up and Punch) are unwieldy and it takes a lot of effort to get used to their movements - with the large sprites proving to be a disadvantage, as it makes it easier for the characters to get hit by obstacles or enemies. Even the smaller Asterix is difficult to control smoothly, with the most frustrating situations finding you constantly falling through bottomless pits after bumping on the ceilings during crucial jumps. Combat itself is problematic. Asterix is no Mario. You can't kill enemies by jumping on their heads. As soon as you touch enemies, you take damage. The only way to defend against the goons is by punching, which is completely useless. Both Asterix and Obelix's reach is so short that you will get hit by the enemy first before you even land a single punch. If you want to play the game, you have to go against your instinct and just avoid the enemies, effectively removing a large portion of the game mechanics. 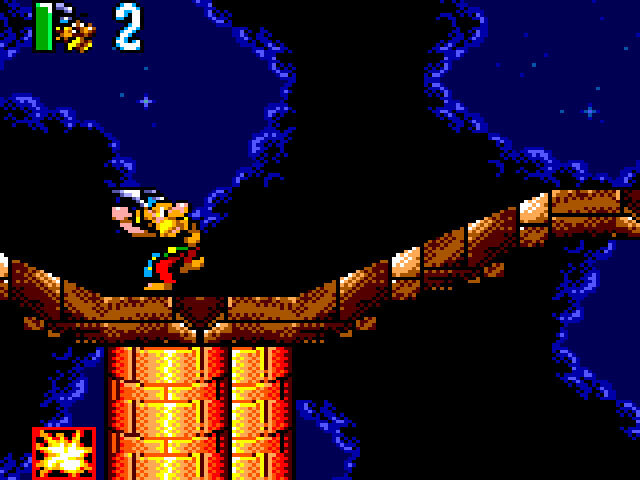 Playing Asterix the Great Rescue as a simple platformer (trying to get to the end of the stage as fast as you can while avoiding the enemies) is possible with the right amount of skill and patience, but it doesn't feel fun and seems like a waste of your time, considering that there are better platformers on the Game Gear. I love Astrix as a character, but it is a pity the game isn't as fun as Mario.